Posted on June 8, 2018 at 6:00 am. It’s been a LONG month of SOL testing — but today it finally comes to an end. The LAST SESSION of SOL make-ups will be held for all grade-levels in the library this morning. But for the rest of the school — we will be following a NORMAL class schedule today. Winner winner, chicken dinner! The annual 8th grade CASINO NIGHT is TODAY at 6 p.m. in the cafeteria. There will be table games, prizes, dancing, selfies, delicious food, and of course hanging out with your best friends. Feel free to dress up — or dress down — but either way: follow the dress code. Casino Night at WMS — get in on the fun!! And speaking of books — If you’re looking for something good to read this summer, the TAB book club has a few TOTALLY AWESOME suggestions. Check it out! And now it’s time for WOLF PACK PRIDE! 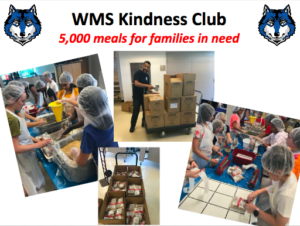 The WMS Kindness Club has been spreading kindness throughout our community all year long — but their final event took it to a whole new level. Kindness Club members partnered with the Outreach Program yesterday to package 5-THOUSAND meals for people in need. All of the meals were then donated to the Arlington Food Assistance Center, which feeds over 2-thousand local families every week. The Kindness Club will be back next year with a whole new slate of community service projects and initiatives. So if you’d like to make the world a “kinder” place, be sure to join the team next fall! And finally today, there’s been a LOT of talk this year about school safety — not just here at Williamsburg, but at schools all around the country. Up next, student-reporters Annabel P. and Natalie S. examine a number a strategies used to keep our community safe — and what’s being done to make it even SAFER.